Evangelist Don Mathis will preach in Revival and Evangelistic Services at the Aurora Community Revival May 17-22. Services begin nightly at 7:00 p.m. Sunday through Friday. Dr. Mathis is in his tenth year of full-time evangelism after serving as pastor, as Executive Director/Minister of the West Virginia Convention of Southern Baptists, and as Director of Pastor-Staff Leadership with LifeWay Christian Resources of the Southern Baptist Convention. He has preached in more than 650 revival meetings. 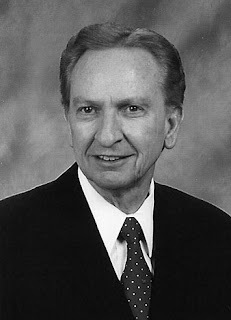 Mathis served as pastor of Central Baptist, Winchester, 1994-96, during which time the church recorded the highest Sunday School and Worship attendance in its eighty-five year history. Previously, he was pastor for twelve years each of Central Baptist, Corbin and Southside Baptist, Princeton. Both congregations tripled in attendance and membership. The Corbin congregation had more than two thousand additions with average Sunday School attendance increasing from 330 to 945 and Worship growing from 400 to more than a thousand. A native of Hopkinsville, he is married to the former Sharon Daugherty of Ohio County. They have two adult children and one granddaughter. Dr. and Mrs. Mathis reside in Bowling Green. He is a graduate of Austin Peay State University and holds both Master of Divinity and Doctor of Ministry degrees from Southern Baptist Theological Seminary, Louisville. Also, Cumberland College, Williamsburg, honored him in 1988 with the Doctor of Divinity degree. Mathis was president of Kentucky Baptist Convention, 1985-86 and Kentucky Baptist Pastors Conference, 1981-82. He has served as Association Moderator, Sunday School Director, and for twelve years in two associations as chairman of evangelism. At the Southern Baptist Convention level, he served as Trustee of LifeWay Christian Resources and is currently serving on the Committee on Nominations. He has written two books: Surviving and Thriving in Today's Ministry and The Pastor-Staff Search Committee Guide, as well as regularly contributing to several leadership magazines. We'll have a bonfire (thanks to the ice storm) to roast hot dogs and toast marshmallows. Come on out and join us for a fun community event. Stay for the movie! After enjoying a hot dog or two, come on in for the movie Fireproof. We'll be serving popcorn and drinks before and after the movie. Aurora Baptist Church was started in August of 2002. A group of about 20 people began to meet in an individual's home. Soon the group began to grow and found a building to hold regular services. By Easter of 2003 the church had found, bought, renovated and moved into their permanent home. The church now has a membership of over 100 people. They seek to show the love of Christ to the community and spread the news of our Savior as far and wide as possible.